When dealing with your clients, whether you are emailing them, delivering demonstrations, or supporting them via remote desktop, you probably aim to present your company with a uniform corporate identity. If you succeed, this paints you as something between serious and authoritative. ISL Light’s remote desktop support support not only interacts with its users with its fully customizable graphical user interface localized into 27 languages, but also offers them to start the service through a branded access point, which ultimately makes it completely compatible with the corporate image. The first contact is crucial. When a client calls or emails saying they are experiencing some technical difficulties which your company ought to solve as quickly as possible, you should immediately react. Assuming support via desktop sharing is the most convenient approach, the operator has several possibilities of how to start a new ISL Light support session. They can email a link which a client simply clicks, and thus starts a session. 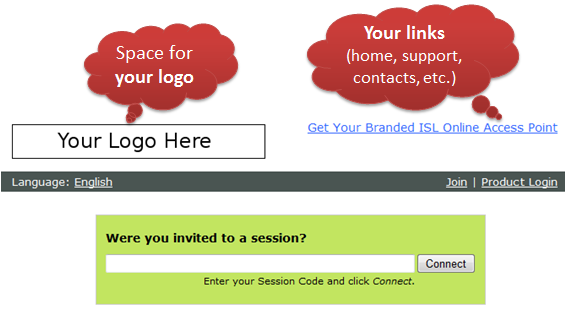 Yet another option is to lead the client to www.islonline.com where they enter a session code in a dialogue box. The most unique way to initiate a new ISL Light session, and also the most appreciated by those craving for uniform corporate image, is to build your own branded access point. A branded access point is actually a webpage with its sole purpose to start a new ISL Light session. It can be adjusted to suit your look and feel, have your colours, your logo, links to your website, user manuals, and much more. Although most of our customers go for the standard customization options, that is to place their own company logo, some links to their webpages, and another colour scheme in their branded access point, a handful of customers have emerged with a clear vision of a, let’s call it an advanced user access point. To give you a better picture of what I’m saying, here is an example of a basic, standard, and advanced branded access point. If you are a paying customer of ISL Online software, you are welcome to get the standard version completely free of charge. See detailed instructions on how to get a branded access point for your company. But first, play the video below for more information. This entry was posted in ISL Light, isl online, remote desktop, remote desktop support and tagged branded access point, customization, isl light, new session. Bookmark the permalink.